An automated and simultaneous optimization of a vaned diffusor and volute of a centrifugal compressor was studied in this project at TU Darmstadt (Institute of Gas Turbines and Aerospace Propulsion). The study was done in cooperation with NUMECA Germany and Kompressorenbau Bannewitz (KBB). For the automated generation of geometry, CAESES® came into play, while NUMECA products were used for the meshing and CFD part. In CAESES®, the shape of the volute’s cross sections as well as the area distribution of the volute got varied. 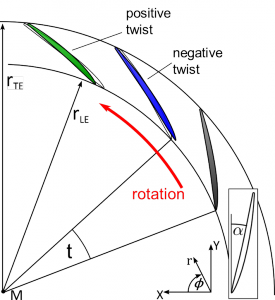 The non-axissymmetric parameterization of the diffusor allowed for quick changes to the blade, by modifying the stagger angle, blade twist, chord length, pitch and rotation. The isentropic efficiency, which was used as objective for the optimization, could be calculated by means of a CFD simulation of the whole compressor stage (impeller, diffusor and volute). 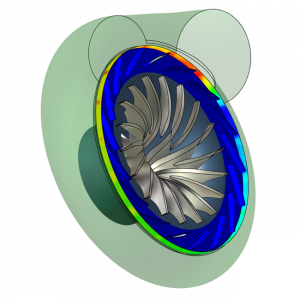 Check out this case study about how to create lighter and more efficient turbine wheels for turbochargers, including design of scallops.